Interested in a customized fan solution? Contact a Fan Specialist today at 800-247-7335 or submit an inquiry! Crary Industries has developed a series of fans to fulfill the need for high pressure air flow or an efficient vacuum system. Three fans are available with 6, 8 or 10 inch diameter outlets. These fans are used in many agricultural, industrial, and commercial applications. Looking for efficient air supply? Centrifugal fan systems draw the air into the inlet of the housing, through the rotor and discharge it at 90 degrees through the outlet of the housing. Our fans are listed by the size of that outlet. The most popular Centrifugal sizes are 6, 8 or 10 inch outlets. But why stop there? If you are looking for a fan system to meet a specialized or custom application, give us a call, we build customized fan configurations of our 6, 8 and 10 inch fans for a variety of industries. Complete fan performance data available on request. Air enters inlet side of fan housing and rotor area. Rotor blades centrifugally push air outward to create a high pressure airflow at the outlet or an efficient vacuum at the inlet. • Crary can help you select the right Crary fan and walk you through the selection of options for your fan application. With your system requirements and key data we can help you find the right fan solution. • Crary also provides other custom fans that are application specific and can work with you on your unique needs. • We have experience developing and testing new fans for a variety of applications and can partner with you to get the right fan. • We have the ability to work collaboratively with customers on new applications from design to testing and launch into production. Contact a fan specialist today to find out more. Crary fans share design elements, principles and components with the fans used on our own wind systems and Lockwood potato equipment, we have the experience you want working with agricultural environments. Crary understands the needs of agricultural end users and OEM’s. Crary fans are used throughout the agricultural market for applications ranging from planting to fertilizer application to harvesting. We also use our fans on our own agricultural product, allowing us to understand the needs of the end customers in agriculture and the OEM’s we service with our fans alike, providing a broad understanding of the needs in the industry. 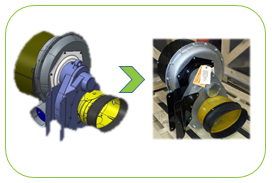 Crary fans use a common design across fan systems, so we can reduce our production lead times, even for customized fan solutions. Our common design and low minimum buy quantities mean that our customers can buy fans when they're needed without keeping a large on-hand inventory.